If you are looking for an escape in Canada, come to the wondrous Robert Simpson Park. Located at 400 John Street, this is one of the most spectacular recreational parks to rest your soul with the nature's best for a while. The place is a real beauty with its splash pad, play garden, fountain, beach and so on. Keep your kids busy at the playground while you enjoy the beautiful sight from the gazebo. Catch a bite at the snacks bar or throw a picnic on the picnic tables. Also don’t miss the Annual events of this place. You will surely enjoy taking part in the Highland Dance Competition, Priorpalooza, Dragon Boat Festival, live concerts with your family and children. 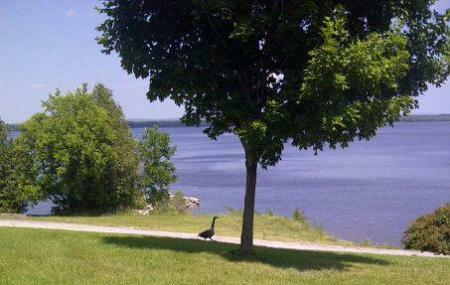 Use Arnprior trip planner to visit Robert Simpson Park and many others to your visit. Fine Accommodation options like Pine Lodge, Knights Inn Arnprior and Arnprior Motor Inn will meet your requirement of where to stay in Arnprior. Generate executable plans on your own or book the top rated Arnprior vacation packages for your visit. Read more on how to reach Arnprior. Lovely park, lots of green space. Great splash pad and play ground. Lovely park ....excellent picnic spot!! Lovely little park on the Ottawa River, with a nice beach and playground for the kids. A great community place for family activities. Swimming (with a little cost and lifeguard on-site), a small play ground, and a big grass field. A lot of parking spots. A ideal place for a picnic since it got great views of the river.